Time-correlated single photon counting (TCSPC) is an amazingly sensitive technique for recording low-level light signals with picosecond resolution and extremely high precision. TCSPC originates from the measurement of excited nuclear states and has been used since the late 60s. For many years TCSPC was used primarily to record fluorescence decay curves of organic dyes in solution. Due to the low intensity and low repetition rate of the light sources and the limited speed of the electronics of the 70s and 80s the acquisition times were extremely long. More important, classic TCSPC was intrinsically one-dimensional, i.e. limited to the recording of the waveform of a periodic light signal. Light sources ceased to be a limitation when the first mode-locked Argon lasers and synchronously pumped dye lasers were introduced. For the recording electronics, the situation changed with the introduction of the SPC-300 modules of Becker & Hickl in 1993. Due to a new analog-to-digital conversion principle these modules could be used at photon count rates almost 100 times higher than the classic TCSPC devices. Moreover, the modules were able to record the photons of a large number of detectors simultaneously. They were thus able to record a photon distribution not only versus the time in a fluorescence decay but also versus a spatial coordinate or the wavelength of the photons. Multi-dimensional TCSPC was born. Within a few years, more dimensions were added to multidimensional TCSPC. Fast sequential recording was introduced with the SPC-430 in 1995, fast scanning with the SPC-535 in 1997. Time-tag recording was introduced with the SPC-431 in 1996; multi-module TCSPC systems followed in 1999. Since then, the Becker & Hickl TCSPC systems became bigger, faster and more flexible. Recent TCSPC modules, like the SPC-830, can be configured for sequential recording, imaging, or time-tag recording by a simple software command. Multi-module systems, like the SPC-134 and SPC-154, can be used for scanning at unprecedented count rates and acquisition speeds. 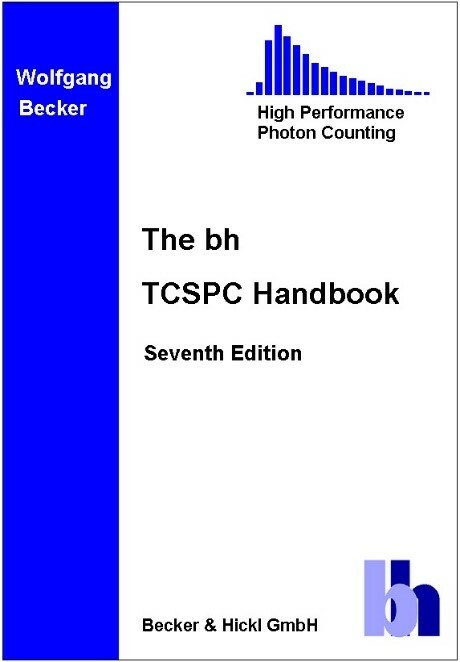 Nevertheless, TCSPC still has the reputation to be an extremely sluggish technique unable to record any fast changes in the fluorescence or scattering behaviour of a sample. The multidimensional features of modern TCSPC are not commonly understood. Thus, many users do not make efficient use of their SPC modules. However, if appropriately used, multidimensional TCSPC techniques not only deliver superior results but also solve highly sophisticated measurement problems. This handbook is an attempt to help existing and potential users understand and make use of the advanced features of modern TCSPC.